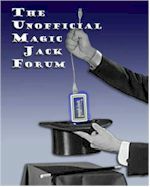 Do magicJackGO and magicJackPlus simultaneously exist? [ Poll ] Constant Clicking. What routers work the best with MJ+? How to use static IP with magicJack Plus ? How to install windows 10 with magic jack? What is Best Cordless Phone to use with router? MJ+ and Google Voice/Talk in 2015? Is this the texting feature MJP app has promised (picture)? Magicjack Go vs Express - What's the difference? Attention your magic jack subscription has expired message? Possible to sell a MJ+ dongle? Amazing little portable router -may be useful with MJ+ too? QoS for MJ+ and TP-Link modem/router? How do you correct the time stamp? Anyone getting delayed voice messages?